This is my column in the July edition of the Tennessee Bar Journal. It is reprinted with the permission of the Tennessee Bar Association. 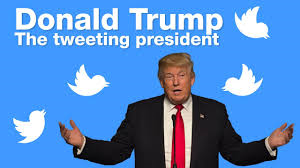 The question that should now be asked is, “What did the President tweet, and why did he tweet it?” Our 45th President, Donald John Trump, has become our Tweeter-In-Chief. President Trump communicates through his midnight tweets. President Trump will be remembered for tweeting that President Obama had wiretapped him. The President defends his tweets saying it’s a great modern means of communication. His defenders say he should no more be criticized for tweeting than FDR should have been ridiculed for using the radio for his Fireside Chats or JFK should have been denounced for making speeches on television. It turns out there is no such word. It was either a typo, a tweet-o, or the President made it up. Forget about fake news. It’s a fake word. According to news reports, the explanation for the tweet fragment was that the President was tweeting in bed and fell asleep in mid-tweet. That’s probably just more fake news from the corrupt media. I believe he was tweeting in bed, but rather than falling asleep, Melania told him to stop tweeting and start snoring. This was a full and complete tweet, and so President Trump must have knocked it out after getting a good night sleep. But while the President sought to laugh it off being convivial (or is the correct word “covfefable”? ), some folks in the White House were reportedly not laughing. According to the reports from the corrupt media, some members of the President’s staff are now suggesting that all the President’s tweets be vetted by his lawyers. Again, this could be just more fake news, but according to these corrupt media reports, some White House staffers are concerned about the Presidential tweets to the point that in the words of the late, great Warren Zevon, they are ready to send in lawyers, tweets and money. As a non-tweeting lawyer myself, I think it’s a pretty good idea. But I doubt that it’s going to happen. The client in this case, namely President Tweet, or rather President Trump, probably has no interest in consulting his lawyer before he climbs into bed at midnight and starts tweeting. Melania would probably object as well, as the Presidential bed could get mighty crowded when his lawyers jump in. And if the President doesn’t want his tweets vetted by counsel, there is really nothing that can be done about it.